So, today was about as fun as accidentally pooping your pants on a water slide. Meaning, no fun at all (unless you’re into that kind of thing, in which case….stop reading my blog). It’s partly my fault. OK, so it is my fault. I drank way too much white wine last night, which I don’t even like to drink, and woke up feeling like the room was spinning and someone had dropped a cinder block on my head. I threw up a few times and remained immobile until I fell asleep and woke up—not refreshed, but no longer feeling like I was in the seventh circle of Hell. Of course, this happens to everyone. This, and difficult phone conversations with people we love very much. Which also happened. I just wanted to see if I could manage to vomit, have diarrhea, and cry all within 12 hours. Around 6ish, when most people are having dinner and winding down from a productive day, I made coffee and decided to go for a run. My aspirational self thought this would make me feel better, but then reality kicked in, as it usually does. I quickly walked home after running approximately 2 feet, so as not to vomit for the 18th time. 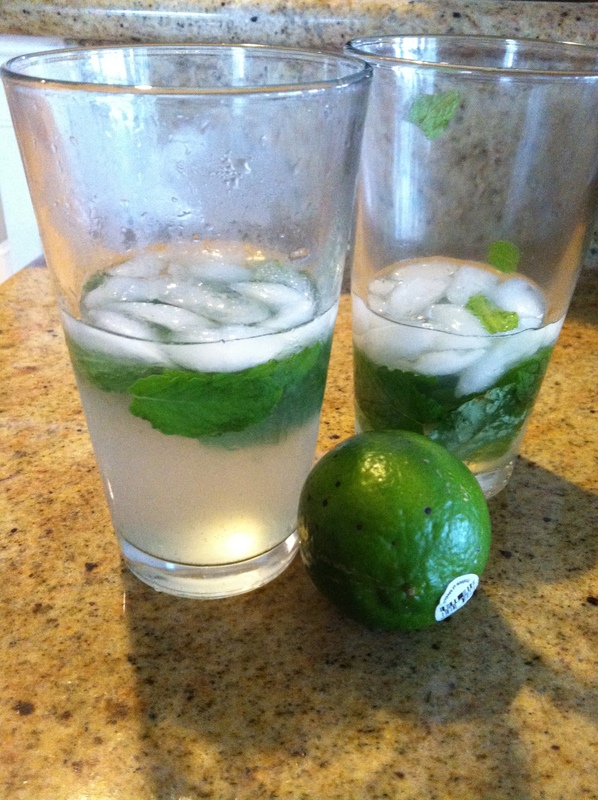 On a lighter, more relevant note, I made mojitos for the first time last weekend and will provide a recipe so that you, too, can cope with alcohol beat the summer heat with a nice, refreshing cocktail. I also made delicious breakfast burritos with eggs, cheese, black beans, fresh avocado, salsa, and sour cream. Today I had leftover pizza with ranch, which is why these recipes are a week old. Make a simple syrup with two parts sugar, one part water over medium heat. The sugar will dissolve as the mixture thickens. Add some mint leaves for extra flavor.